Listen to the Cancer.Net Podcast: Tobacco Use, adapted from this content. Myth: Smoking is a matter of personal choice. Fact: While more than half of all Americans who ever smoked quit successfully, nicotine (the chemical found in tobacco products) is addictive, and nicotine dependence may continue for a long time in many people. Myth: Smokers can quit by themselves; a doctor's advice isn't needed. Fact: Doctors can provide support and information to help motivate people to quit. In fact, efforts to quit that include a doctor's guidance are twice as successful as other attempts. Myth: Quit rates with most treatments are low. Fact: Quit rates longer than five months can approach 20% to 30% with medication and behavioral counseling. Taking effective medication can double or triple the quit rate. Among people with cancer, quit rates often exceed 50%. 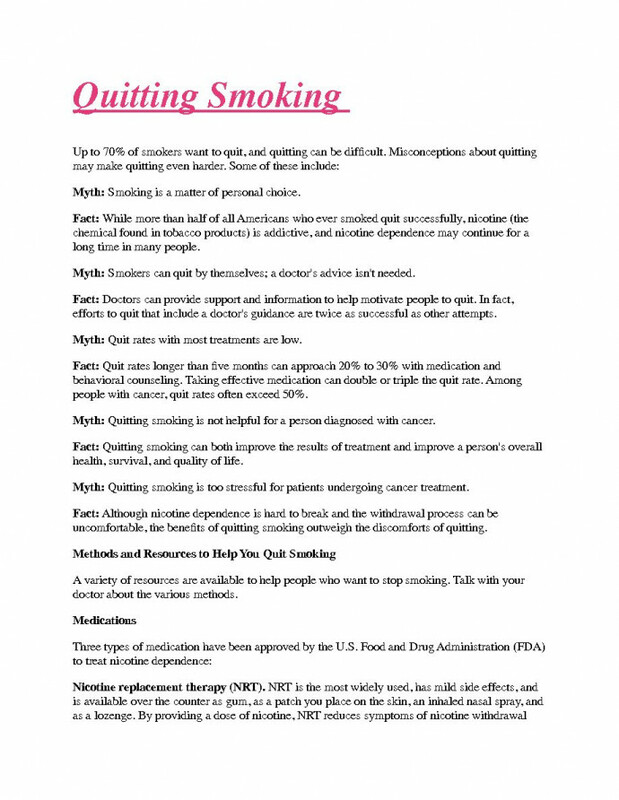 Myth: Quitting smoking is not helpful for a person diagnosed with cancer. Fact: Quitting smoking can both improve the results of treatment and improve a person's overall health, survival, and quality of life. Myth: Quitting smoking is too stressful for patients undergoing cancer treatment. Fact: Although nicotine dependence is hard to break and the withdrawal process can be uncomfortable, the benefits of quitting smoking outweigh the discomforts of quitting. A variety of resources are available to help people who want to stop smoking. Talk with your doctor about the various methods. Nicotine replacement therapy (NRT). NRT is the most widely used, has mild side effects, and is available over the counter as gum, as a patch you place on the skin, an inhaled nasal spray, and as a lozenge. By providing a dose of nicotine, NRT reduces symptoms of nicotine withdrawal and craving. Studies show that people using NRT are twice as likely to quit smoking compared with people receiving a placebo (inactive medicine). Bupropion (Wellbutrin, Zyban). This drug helps reduce withdrawal symptoms and helps people break the habit. Clinical trial results suggest that bupropion doubles the chance of successful quitting compared with a placebo. Side effects are slightly more serious than for NRT and include jitteriness, insomnia (inability to fall asleep and/or stay asleep), headache, dry mouth, and risk of seizure. Varenicline (Chantix). This FDA-approved medication has been shown to help people quit smoking by preventing nicotine withdrawal symptoms. Although not FDA-approved for nicotine dependence, several clinical trials have indicated the antidepressant, nortriptyline (Aventyl, Pamelor), and a medication for high blood pressure called clonidine (available under several brand names) may be effective. However, both have potentially serious side effects and may not be appropriate for many smokers. Research to find new drugs to help people quit smoking is ongoing. In addition, efforts are underway to develop effective nicotine vaccines. How is smoking hurting my health? What are the health benefits to quitting smoking? Will smoking or tobacco use affect my cancer treatment? How can I prepare to stop smoking? How can you help me stop smoking? What medications are available to help me stop smoking? What behavioral changes do I need to make to stop smoking? How can I avoid or reduce the triggers that make me want to smoke? What smoking cessation resources are available in my community? How can family and friends help me? How often should you and I discuss my progress?